With hundreds of new business websites being created every minute, it’s becoming increasingly challenging to stand out in competitive industries. It’s no longer enough to simply convey valuable information. You need to share this information in provoking ways that are visually appealing to your target market. As a web designer or marketer, you have a number of different tools available to you when it coms to designing pages. In the most basic sense, you have textual and visual content. While the former is certainly important, it’s not always the best option if you’re looking to grab attention. 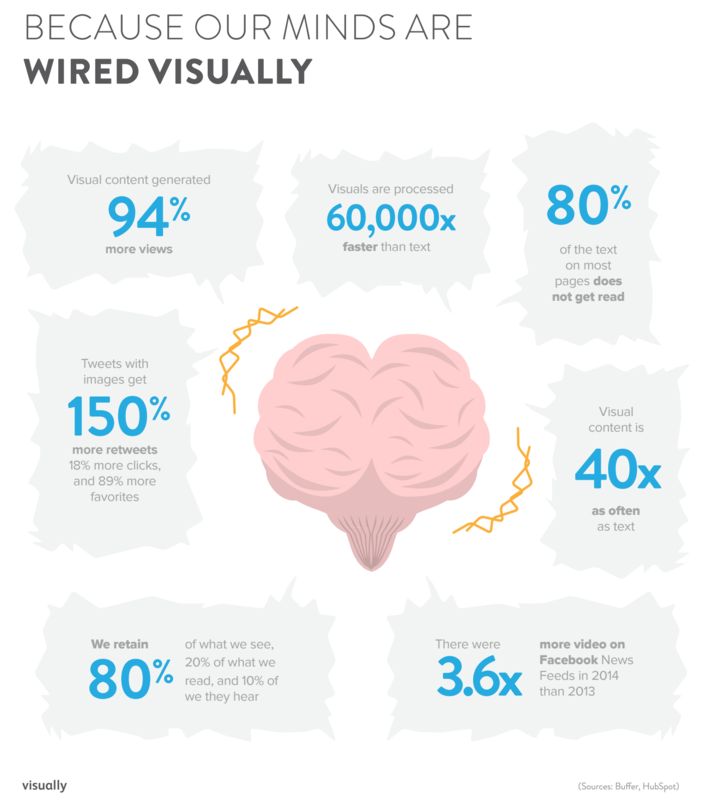 Visual content generates 94 percent more views than written content. As humans, we retain 80 percent of what we see, 20 percent of what we read, and just 10 percent of what we hear. Visuals are processed an incredible 60,000-times faster than text. 80 percent of text on most pages is never read. Visual content is read 40 times as often as text content. In other words, visuals are a wise investment. If you want to enjoy maximum returns, high engagements, and successful results, then you must be willing to invest in visual on page design features that stand out and differentiate your value offering as unique and valuable. The good news is that there are tons of different design options. This flexibility lets you get creative with how you mix and match various features. Feel free to come up with your own strategies, but find a way to include the following tips as well. Subtle movement is something that’s really popular right now. We’re not talking about the terrible movement and motion that’s often associated with websites of the late 1990s and early 2000s, but rather pages like this one from Magic Logix, an integrated marketing agency. Something as simple as a sliding menu or floating graphic is enough to diversify a page and grab the attention of customers and users. Movement is also present in parallax design, which will be discussed momentarily. It may seem counterintuitive to focus on whitespace when you’re trying to design a compelling, eye-popping page, but we’re currently experiencing a resurgence in minimalism. Enhanced focus. When there are dozens of different on page elements competing for a user’s attention, it’s difficult to connect with your audience. However, when white space is present, users are forced to focus on the things you want them to notice. Higher quality. Consumers are naturally conditioned to relate tidiness and simplicity with high quality. It’s why minimalist architecture and modern homes are often purchased by celebrities and wealthy individuals. It’s also why high-end retail stores only put a certain amount of inventory on the floor. In terms of web design, less equals more. Increased retention. According to a research study by Human Factors International, whitespace actually increases user comprehension by as much as 20 percent. Want people to understand and remember your content? Use whitespace. There are dozens of other case-specific advantages to using whitespace, but these three stand out. If you’re currently filling up every nook and cranny of your pages for the sake of maximizing space, consider taking a simpler approach. For an idea of what the proper use of whitespace in web design looks like, check out this example from Suki, a UI design firm. Scrolling websites (parallax design) are very popular right now. It’s the newest craze in web design and users can’t get enough. Here’s a really creative and unique example of this scrolling design in action. As you can see, it engages the user and forces you to pay attention to what’s happening on the page. While you may not want to go as extreme as the previous example, there are plenty of opportunities to combine a minimalist approach and parallax design for a simple and engaging page that stands out. Apple has done a nice job of this recently. Here’s a good example of what it looks like in action. Color conveys a lot. It can be used to create a targeted emotional response or drive a particular action. When used in conjunction with whitespace, color can also provide a very extreme contrast that draws users to a particular on page element. If you’re designing a landing page or product page, experts suggest using pops of bright color in the areas surrounding your calls-to-action. This naturally pulls the customer to the conversion element and increases the chances of impacting their decision. But not all colors are created equal. There’s a lot of research and ongoing study about which colors convert the best in which situations. You may want to read up on this before developing a specific design strategy. While movement and color are often used to point users in a particular direction, you can sometimes do more with less by using shapes and directional cues to guide visitors. Something as obvious as an arrow, or as simple as an image of someone looking in a particular direction, can encourage users to look at a specific element or CTA. Think about this as you design pages and organize information. Previously, when a website was built, it was only intended for desktop users. Therefore, the pages only had to be formatted to fit standard screen sizes. However, with the influx of new mobile devices and a large variance in screen sizes, you can no longer design a page for desktop and then assume it will be visually appealing and functional on a smartphone. The answer is responsive web design. Responsive design is now considered a best practice and allows a website to naturally load in a certain format depending on the device being used. If you aren’t responsive in 2016, you’re falling behind the curve. When correctly used, visuals can enhance your marketing, advertising, and engagement efforts. And as the internet becomes increasingly visual – moving away from written content and towards video – it’s imperative that you find ways to stay relevant. In order to stand out and capture the attention of your users, you must be willing to get creative. We’re at a distinct turning point and only visually-inclined brands will survive.